Memory foam mattresses are perfect for those who are looking for support during the night and relief from pain and discomfort. This type of support means nothing if you do not have the right bed frame. If you recently purchased a memory foam mattress or are looking into one, you need to find a bed frame that works as well as your mattress. Here is our list of the best bed frames for memory foam mattresses. Now that you’re armed with a better idea of what kind of things you need to search for in a bed frame, here are some of the best bed frames that you can purchase to help support your memory foam mattress. If the previous bed frame on this list wasn’t simple enough for you, you may find greater joy in the Zinus SmartBase mattress foundation. The Zinus SmartBase mattress foundation is a metal bed frame consisting of two separate pieces that merge together and resemble two portable folding tables. Much like the previous mention, this bed frame requires no tools to put together and can be assembled in minutes. This frame is approximately 14 inches tall and gives you plenty of space to store extra items underneath. This bed frame is also said to be noise-free, can support up to approximately 500 pounds, and can also support a headboard if the manufacturer’s brackets are purchased. This bed frame also has very few complaints or reported issues. Some of the issues that have been reported include squeaking if the bed frame is not properly assembled and the fact that the bed frame will move on hardwood floors due to the lightness of the frame itself. However, these are issues that can be fixed and do not affect the overall performance of the bed frame. For those who are looking for a bed frame that is affordable, simple, and high enough to provide plenty of extra storage space, the Zinus SmartBase mattress foundation is a great choice. For those who are big on a bed that is easy to use and even support, the eLuxurySupply platform bed frame is definitely one that meets both of these requirements. Made from 100 percent North American Pine wood, the eLuxurySupply platform bed frame supports up to 900 pounds of weight in an aesthetically pleasing wooden platform. Rather than requiring users to spend hours pouring over the assembly of this product with power tools and screws, the eLuxurySupply platform offers a simple assembly with snap-in pieces. To support the bed, this frame uses wooden slats. In addition, the frame is shock resistant and durable. Fortunately enough, the bed frame functions exactly as advertised. There are only two issues that are said to come with purchasing this bed frame. The first issue that many users have encountered is said to be a squeaking that comes with use over time. The second issue that is only minor nature is the fact that there is no place to attach a headboard. However, these issues are not big enough to deter you from buying this bed frame. Overall, the eLuxurySupply platform bed frame is a well-built piece of equipment that is made with convenience and durability in mind. If you love bed frames that do the job and don’t take up too much time, this one is definitely one you should look into. Sometimes you just need something a little fancier looking and the DHP Dakota Faux Leather Tufted Upholstered Platform Bed is a perfect option for those moments. 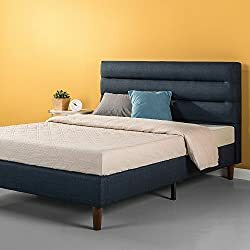 The DHP Dakota Faux Leather Tufted Upholstered Platform Bed is a fully-upholstered, button-tufted platform bed that uses faux leather on the entire exterior of the bed to provide a more stylish presence for your bed frame. The frame is constructed from wood along with metal side rails to keep your bed frame steady and supportive. Like many other frames, this bed frame uses a wood slat support system that is capable of holding up to 500 pounds. The bed frame is said to be easy to assemble right out of the box and is also easy to clean just by wiping down the surface of the faux leather. For some, there have been issues with support and a few users have mentioned that pieces of this bed have broken with only a couple of months of use or even right out of the box. However, quite a few more have stated that this bed frame functions exactly as advertised and has no issues whatsoever. Since there a lot of conflicting statements, it is difficult to say whether or not there are any issues with this bed frame. Besides these reported issues, there are no main issues that need to be stated. 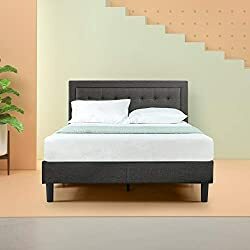 Making a statement with its padded faux leather exterior and unique design, the DHP Dakota Faux Leather Tufted Upholstered Platform Bed is perfect for those who want the support they need without having to compromise on aesthetics. Have you ever wanted to prop yourself up in bed while you’re reading or watching a movie? Have you ever needed to elevate your feet and take a break? If so, the Reverie 5D Deluxe bed frame may be something that you should take a look at. The Reverie 5D Deluxe bed frame is a bed frame that is capable of is capable of raising its lower end, its higher end, and both ends simultaneously. The bed frame itself is fully-motorized and comes with a remote that is able to control the movements while maintaining total silence. Some of the cool features that this bed frame comes with includes bed handles that keep your mattress firmly in place, a vibrating motion designed to help massage the user, and backlit batteries on your remote that allows you to use your bed frame even in the dark. Better yet, this bed frame is capable of holding up to 850 pounds. Although you would think that this piece of technology would come with severe disadvantages, this bed frame has been adored by those who have purchased it and there have been no reported problems with this bed frame so far. If you are looking for luxury and a ton of features on your bed frame, you should definitely look at the Reverie 5D Deluxe bed frame. Don’t let the simplicity of this frame fool you, Keetsa’s The Frame is an excellent bed frame that is more than capable of supporting your memory foam mattress. Keetsa’s The Frame is a very sturdy, attractive bed frame built from gold brushed steel to create an earthy yet luxurious vibe overall. The support system used to hold up your mattress is a wood slat system that uses birch slats spaced 3 inches apart. The frame itself is easy to assemble, provides plenty of room for storage with 14 inches of space, and is capable of holding up to 2,000 pounds of weight! Many of its users can testify to the sturdiness of this bed frame and very few users have complained. However, one of the more common issues is that the frame has been known to squeak for some users. Besides this minor flaw, Keetsa’s The Frame is almost perfect. Built with simplicity, aesthetic, and support in mind, Keetsa’s The Frame is great for those who appreciate bed frames that look great and stay durable. To finish this list, we present you with one of the most supportive and technologically advanced bed frame: the Reverie 9t Adjustable Bed Base. The ability to move both ends of the bed upward both individually and simultaneously. A quiet massage option that has 10 different intensity options. A backlit remote that controls all of the bed's technology. A Bluetooth option that allows you to connect your phone to your bed frame and use it in place of the remote. A wireless charging pad for your devices. A light located under the bed that can be used as a night light. Side rails that are removable as well as brackets to keep your mattress firmly in place. In addition to these features, the bed is extremely supportive and can handle up to 850 pounds of weight. Those who have purchased this bed frame have loved it and there are few disadvantages to the bed frame that are mentionable. The only disadvantage for some could be the large price tag, which is quite heavy for those in need of a budget-friendly option. Overall, the Reverie 9t Adjustable Bed Base is an excellent frame for those who want a lot of extra features with their purchase. There you have it! Now you have a great selection of bed frames to choose from that will work great with your memory foam mattress. If there was something on this list that we missed or if you didn’t fall in love with any of your choices, make sure to use our buyer’s guide to help you choose a frame that is right for you! If this is your first time purchasing a bed frame, you might think that absolutely any bed frame will do. However, there a lot of qualities and features in a bed frame that you will need to take into consideration before you purchase a bed frame for your memory foam mattress. Before we start taking a look at some of the best bed frames, here is a short bed frame buyer’s guide that will help you determine what kind of bed frame you are going to need to look for. When it comes to bed frames, size is important! Although bed frames will state a general size for which they are produced, sizes will vary depending on the manufacturer and they will not necessarily fit the bed that they are made for, even if they do state the general size on their packaging. When you begin your hunt for a bed frame, make sure to pay attention to the exact measurements listed by the manufacturer and compare these to the measurements of your memory foam mattress. This way, you can guarantee that your mattress will fit into or onto your bed frame when you purchase it. Much like size, height is also important when it comes to your bed frame. One reason to check for the height of the bed frame is to make sure that you can comfortably get into your mattress without having to push yourself up or bend down far to go to bed. Another reason to take height into consideration is for storage space. If you’re someone who likes to have easy access to certain personal items underneath the bed, you may want to purchase a bed with a taller height. If you are someone who doesn’t need the extra room, a bed with a medium height will suffice. You really only have two options to choose from when it comes to the build material of a bed frame. You are either going to have to purchase a bed frame that is metal or a bed frame that is wood. Although this seems simple enough, both materials come with their advantages and disadvantages. For example, wood may be more aesthetically pleasing but may also be more likely to break or fall apart with use. Metal, on the other hand, is generally sturdier but is known to make creaking sounds when you shift around and may also move if the frame is not heavy enough. Think about what you are truly looking to get out of your sleep experience when you begin looking at different bed frames. 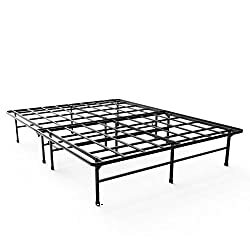 Build frames should obviously support you as well as your mattress and this will be the case for the majority of the bed frames when you initially purchase them. However, some bed frames are not built with durability and can break down over time. Durability is a very big thing to look for when you are shopping around for a bed frame. Make sure to read about the bed frame and see if it prevents against the mattress slumping into the frame or causing pieces to shift. After all, a bed is only as good as the bed frame that it is on. While design is often the last thing you should probably be thinking about, it is something that it is important to a lot of people. Although some bed frames are brilliant when it comes to supporting the mattress, they may not be aesthetically pleasing or match the overall theme of the bedroom that they are going to be placed into. Before you purchase a bed frame, take a look at the room that it is going to go into and ask yourself, is this bed frame going to work with my bedroom? Also, ask yourself if it is important to have a bed frame that matches. For some, functionality goes hand in hand with aesthetic. Although plain bed frames may work, some people will want extra drawers, wheels to easily shift the bed frame around the room, and different features that make the bed frame more than just a bed frame. If these kind of extra features are important for you, make sure to shop around and see what options you have to choose from. However, it is important that you still take the major features such as support and durability seriously. It may be nice to have extra storage in your bed but it won’t be great if that bed frame breaks down or ruins the quality of your sleep. Last but not least, you need to take into consideration how easy to use your bed frame will be. What does this mean? Well, you need to see how long it will take to put your bed frame together, how easy it will be to take apart, and how easy it will be to move around while taken apart or even while it is still completely together. If a bed frame is worth hours of labor to put together or move, get it! However, if you want a bed frame that is much easier in all of these categories, keep that in mind when you are shopping around.